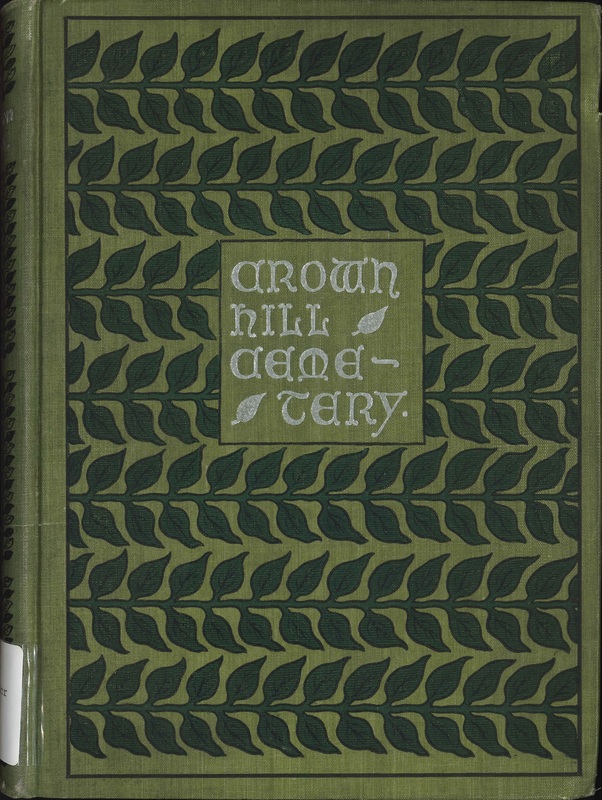 There is a book about Crown Hill Cemetery that I recently ran across in the Indiana State Library’s collections. 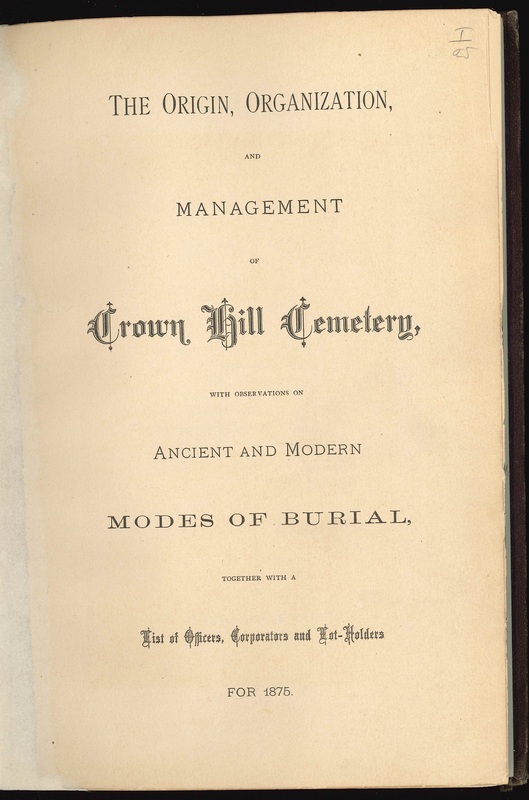 The book has a particularly long title – “The Origin, Organization and Management of Crown Hill Cemetery with Observations on Ancient and Modern Modes of Burial, together with a List of Officers, Corporators and Lot-holders for 1875” – but it was the latter part of the title that piqued my interest. A list of lot-holders sure sounds like a useful resource for researchers looking for names of the earliest purchasers of burial plots. There are also two later editions of the book published in 1888 and 1896, containing growing lists of lot-holders. 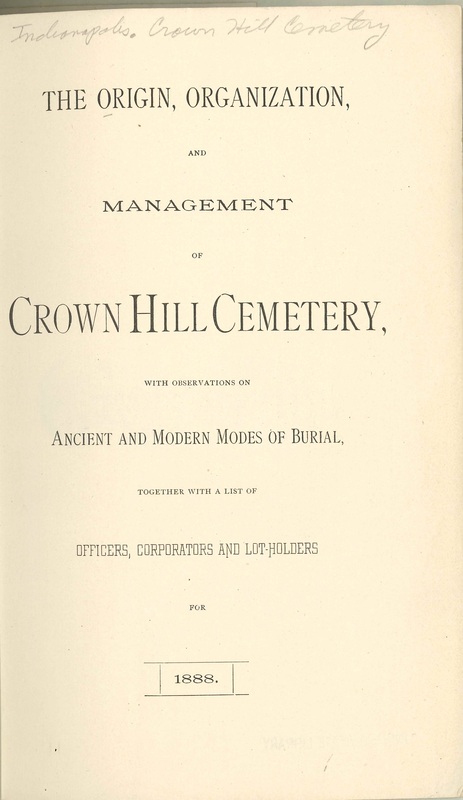 Organized in 1863, Crown Hill Cemetery in Indianapolis was incorporated as a non-profit, non-denominational and non-sectarian cemetery with a board of thirty corporators. At the time, there was a critical need for a new city cemetery for Indianapolis. The old Greenlawn Cemetery had become inadequate for future expansion and its proximity to the flood-prone White River was no longer desirable. The collective civic-mindedness of James Blake, Calvin Fletcher, Sr. and James M. Ray helped them form a group to select a site and draw up plans for a new cemetery. The Daily State Sentinel newspaper announced the June 1, 1864 formal dedication of Crown Hill Cemetery and that a public sale of lots would then begin on June 8, 1864. The 1875 edition of the book, with 65 pages, was issued in both a plain cloth binding and also a more ornate embossed cover with gilded edges. The 1888 edition was issued as a paperback pamphlet and expanded to 92 pages. Unlike the 1875 and 1896 editions, there are no photographs in the 1888 edition. 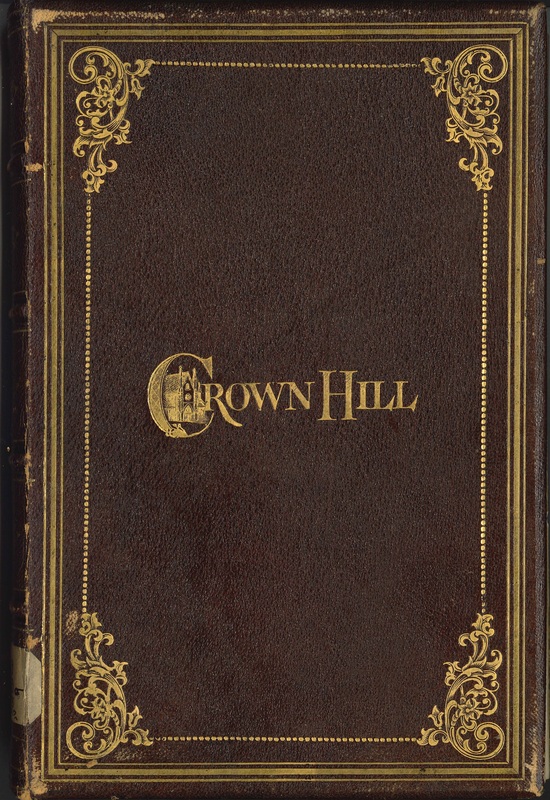 The 1896 edition expanded in both page size and length to include 217 pages, mostly consisting of lot-holder names, and it originally included a folded map of the cemetery grounds. 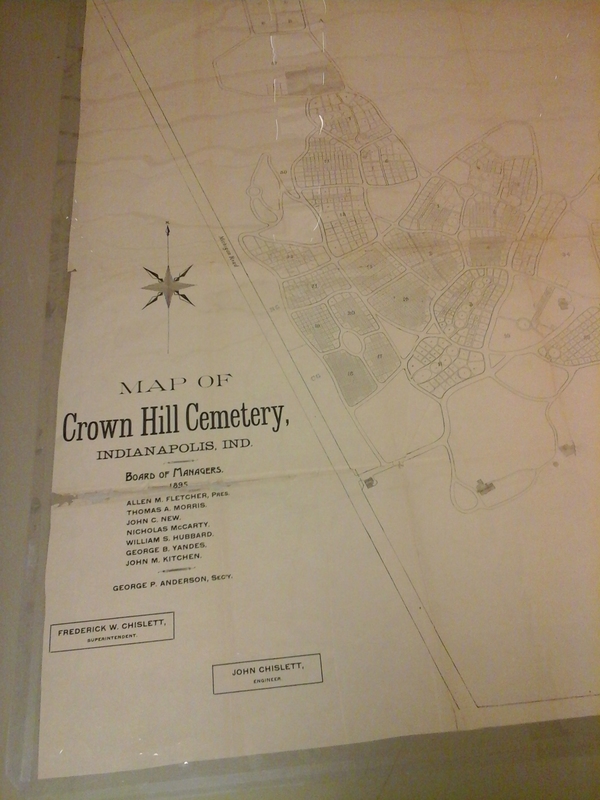 The map is dated 1895 and the Indiana Division’s copy will require some conservation treatment before it is ready to be digitized. However, the entire 1896 book can be viewed at Internet Archive. In all three volumes, the surnames are only arranged alphabetically by the first letter and are not in strict order. After a bit of hunting, I was pleased to find my ancestor, George Buchter, listed in all three editions as the owner of Lot 57 in Section 16. Keep in mind that finding a person’s name listed in the books does not imply that person was living, dead or buried in the lot. His wife Barbara was buried there in 1871, and George died in 1879 and was buried there. His children continued to use the family burial lot until 1945. 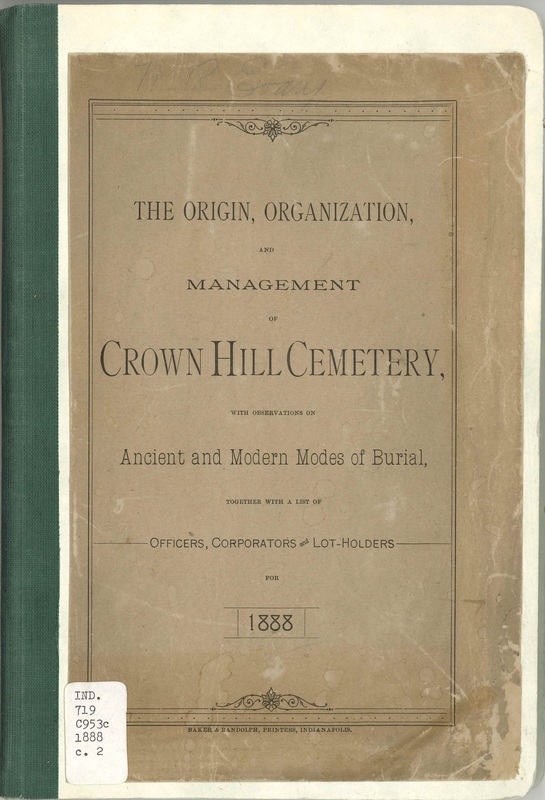 Since these books are not lists of all the burials in the cemetery, better resources for discovering all Crown Hill burials are Find-A-Grave, the Crown Hill burial locator or the Crown Hill office. For more information, read the facts and events on the timeline of Crown Hill history. View select photographs of tombstones and buildings at Crown Hill in the Division of Historic Preservation and Archaeology’s digital collection available through Indiana Memory. Take a look at the April 1896 article in Park and Cemetery, a monthly journal devoted to parks and cemeteries. Even in the nineteenth century, Crown Hill was nationally recognized as an excellently planned and maintained cemetery, as it remains today.